Final: The Terriers histroic season has to come to an end as they lose to the Bulldogs 58-53. Recap: It was a sad sight to see the Terriers end one of their best seasons on such a low note. When these two played each other earlier this year it was all about the defense and tonight was no different. The Bulldogs were in control for the most part but the Terriers did have some chances to catch up. Their best chance came with under a minute to play in the second half. Terrriers junior guard Katie Fox connects for a layup to make the score 55-46. On the Bulldogs next possession senior guard Courtney Schissler turned the ball over causing them to foul sophomore guard Leah Fechko. Leah went to the line hitting one of two free throws Terriers trail by eight. Soon after Bulldogs senior guard Stephanie Cardamone turned the ball over allowing junior forward Jaymee Veney to make the layup 55-49. Now with under 20 seconds to play Fox finds Veney for the opener jumper 56-51 Bulldogs still with the lead. On their last possession the Terriers took too much time off clock but Fechko was able to hit layup cutting the Bulldogs lead to four. After the Bulldogs went back to the foul-line, senior guard Jenniqua Baily hit the first then missed the second but the Bulldogs got the offensive board and were able to hold the ball until time expired. The Bulldogs could have put away the Terriers earlier in the game but they turned the ball over 20 times. The Terriers took full advantage of that scoring 20 points off turnovers. But the Bulldogs have proved their ability to rebound will get them wins, they out rebounded the Terriers 46-36. Senior forward Naana Ankoma-Mensa has been playing great all season long for the Bulldogs and it has certainly carried over in the playoffs. Naana proved to be too much for the Terriers she had 14 rebounds and 12 points. She was one of four player to score in double digits. Schissler scored a team high 13 points she was 5 of 10 from the field. It may not have been the Terriers best performance but they kept fighting to get back in this one but it wasn’t enough. Junior guard Eilidh Simpson took a nasty spill earlier in the first half which could have effected her lower ankle injury she suffered in last weeks game against the LIU Blackbirds. After today’s spill Eilidh did not look comfortable playing. Simpson finished the game with zero points. With Simpson struggling other players did step up. Junior guard Kaite Fox scored a career high 14 points and was 5 of 10 from the field. Fox was able to find her teammates open shots finishing with 7 assists. Junior forward Jaymee Veney played well, Veney scored 12 points and hauled in 9 rebounds. After having a quiet first half junior forward Sarah Bennedetti hit four three’s in the second half, she scored 12 points tonight coming off the bench. It is the third time this season the Terriers have loss to Bulldogs and all three contests were decided by five points or less. The Bulldogs advanced to Semi-finals and they will take number one seeded Robert Morris University. The season maybe over for the Terriers but their future looks bright with this young talent. Halftime Update: The first half is in the books the Terriers trail the Bulldogs 21-15. It has been a rough first half for the Terriers. The team is unable to get anything going offensively. They shooting 22.2% from field hitting only 6 of 25. The Terriers have relied on the 3 ball for most the season but so far it hasn’t worked for them they tonight. From beyond the arc the Terriers are shooting 2-13. Junior forward Jaymee Veney and sophomore forward Leah Fechko lead the Terriers with 6 points. 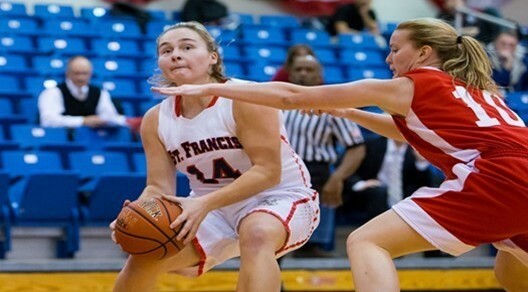 After getting hurt in the LIU game this past Monday junior guard Eilidh Simpson is playing. Simpson is trying her best but the injury does look to be bothering her. She has zero points in the first half. Shooting the ball hasn’t been their only problem in the 1st half, the Terriers have trouble controlling the ball. They have 10 turnovers. Even with a six point lead the Bulldogs have not strong so far. The team is shooting 23.5% from the field. Senior guard Courtney Schissler leads the Bulldogs with 6 points. The Bulldogs are finding success by out rebounding the Terriers 27-20. The Bulldogs have out hustled the Terriers by grabbing 10 offensive boards. Senior froward Naana Ankoma-Mensa contiunes to be rebounding machine with 9 rebounds. With Simpson struggling the Terriers as a team need to rally together in the second half.